Not only is February the LOVE month with Valentine's Day, but it is the month I was born! Now I am not one of those fools that tries to pretend that I am younger than I really am... I am turning 42 today, and I am ok with that! Now... I could do without the extra softness around my middle that has taken residency since I turned 40 and all those fun meds I was on last year! But somehow watching the kids in action doesn't burn calories! Here I am at ONE. I don't have any younger ones of me on my school computer, and I have no doubts Mom would be willing to share some beauts... but this will have to do! Apparently someone decided that the zodiak that I have believed for as long as I can remember, has changed. According to him, I have changed to Capricorn... well... for 42 years I have been an Aquarius... I am going to continue believing that! Sorry, dude... I am not listening to your science. Not out of stupidity, but out of stubbornness! I love being an Aquarius! Recently, I have met some great ladies, and ran into quite a few that I already knew at a great little scrap site... 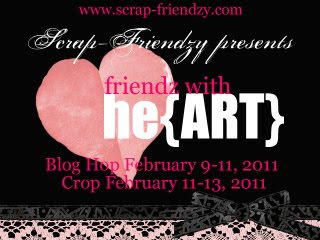 Scrap Friendzy! Come check out what Amy and the others have in store for us! And take a peek at the January sketch challenges! WOW! See... February is a GREAT month!